A vendor contract is a legal protection for both the vendors and the buyers. With terms and expectations properly defined within the contract, the possibility of any disagreements is reduced. Organisations, regardless of how big or small, often have contracts with multiple vendors across different verticals. This means that there are lots of active agreements, which has to be monitored at any one time. The need for an effective contract management system is imperative. A contract management system allows you to easily identify contracts which could potentially bring about issues. Immediate action can then be taken to rectify or ameliorate these issues before it gets worse. A contract management system involves storing your contract records in a centralised repository. This increases visibility as contract terms can be accessed almost instantaneously. With increased visibility, organisations are able to identify potential areas of cost-savings, allowing for the formulation of targeted strategies. A contract management system allows you to monitor the different agreements from multiple contracts, and then enforcing them in order to get the most out of these contracts, as well as to ensure that vendors are performing to standards. A contract management system can be created using Excel. Features for tracking of termination dates can be easily implemented over Excel. 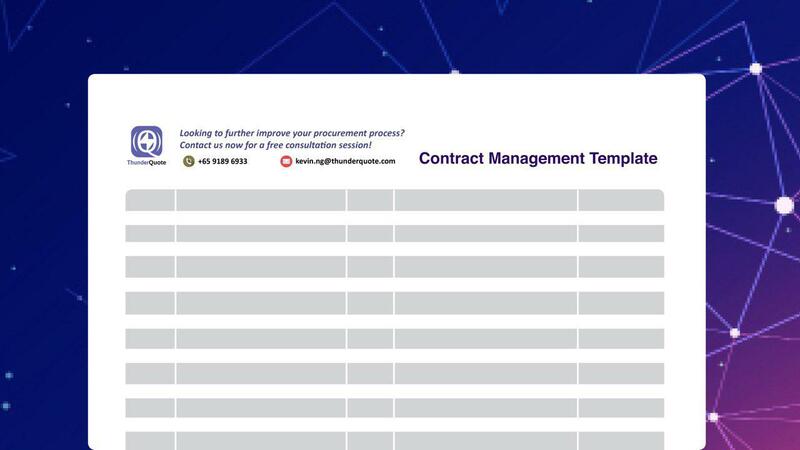 A sample contract management system with a time-tracking feature can be downloaded here. While a smaller organisation can get away with relying solely on Excel for their contract management purposes, larger organisations with different departments each having their own contracts to manage will find difficulties inputting their data into an up-to-date centralised Excel sheet. Adopting a cloud-based procurement software, such as ThunderQuote Enterprise, will be more effective in ensuring that the contract management system will always be up-to-date. With the use of a cloud-based procurement software, the different departments can update their contracts to the system concurrently, without fear of overwriting each other’s updates. Learn more about what’s possible here.